Welcome to The TV MegaSite's Primetime TV Site! This is a show that I always figured I'd like, but I never have time to watch, so I missed the first two seasons. Now I've seen the first episode of the new season, and it is very good. It is very dramatic and shocking. At the beginning of this episode, there is a wedding, and I almost expected it to be a dream or something, since it was all kind of odd. However, it was not a dream. Several very dramatic things happen in the episode that didn't help the sense of heightened reality. I don't know if the show is always this way, or it was just this episode, but it almost seemed like it was trying very hard to be more than just a drama. It does remind me quite a bit of other doctor soap operas I've seen, like General Hospital, ER, and Grey's Anatomy. Jada Pinkett Smith is the star, and she does a great job. It's nice to see a good show revolving around a woman of color for a change. I love Michael Vartan, who plays her husband, so I'm glad I finally did get to see it. There is a large cast, and they all do a fine job. I enjoyed the episode, and it was very exciting. I can't wait to see what happens in the next episode! They definitely have me hooked now. After last summer�s explosive and revealing finale, TNT�s drama series HAWTHORNE is back this June, and the stakes are higher than ever. 2010 NAACP Image Award winner and series executive producer Jada Pinkett Smith stars as Christina Hawthorne, the tough and tireless Chief Nursing Officer whose personal life often seems as chaotic as a packed emergency room. Pinkett Smith is joined by Michael Vartan as surgeon Dr. Tom Wakefield, the father of her unborn baby, and new cast member Marc Anthony as Detective Nick Renata, who carries a flame for Christina. Together they form television�s hottest new love triangle. The highly charged third season of HAWTHORNE is slated to launch Tuesday, June 14, at 10 p.m. (ET/PT). Last year was particularly tough for Christina. Her on-again and off-again relationship with Tom hit rocky times after a serious car accident left him with injuries that threatened to end his surgical career. Although they spent a night of passion together, Christina struggled to figure out if she was ready to commit to a full relationship. That sent Tom into the arms of another woman and fellow doctor, while Christina considered other romantic possibilities, including Det. Nick Renata. The season finale pushed everyone to the breaking point as a massive explosion at the hospital left one of Christina�s nurses severely injured and forced the evacuation of the entire facility. In the midst of the crisis, Christina revealed to Tom the shocking news that she is pregnant. Meanwhile, ER nurse Bobbie Jackson (Suleka Mathew � Men in Trees) one of Christina�s best friends, started dating new arrival Dr. Steve Shaw (Adam Rayner � Mistresses), who left his home in England to escape his father�s criminal reputation. Nurse Kelly Epson (Vanessa Lengies � American Dreams) found her footing after Christina assigned her to head up the pediatric nursing staff. And Camille (Hannah Hodson � TNT�s The Ron Clark Story) struck up a relationship with an ER clerk, but things weren�t always as smooth as she expected. As HAWTHORNE�s powerful third season opens, the very pregnant Christina prepares to walk down the aisle with Tom. But their joy will be interrupted by a series of unfortunate incidents that will challenge Christina both physically and emotionally. At the same time, Nick re-enters � and complicates � Christina�s life when he is called in to investigate a brutal attack in the hospital parking deck. Meanwhile, Tom takes on a new prot�g� (guest star Derek Luke � Antwone Fisher) who catches Camille�s eye. Created by Emmy� winner John Masius (St. Elsewhere), HAWTHORNE is produced by Sony Pictures Television in association with Pinkett Smith�s Overbrook Entertainment and Jamie Tarses� FanFare Productions. This season, HAWTHORNE welcomes new executive producer John Tinker, who shared a St. Elsewhere writing Emmy with John Masius and Tom Fontana. Tinker, whose credits also include Chicago Hope and Judging Amy, joins HAWTHORNE executive producers Pinkett Smith, Jamie Tarses (TNT�s Franklin & Bash) and Miguel Melendez. 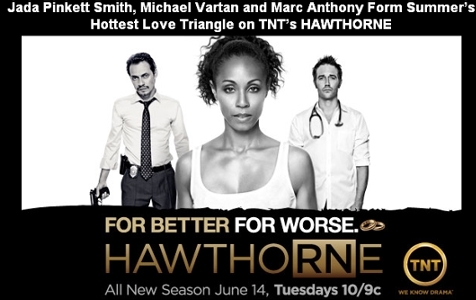 HAWTHORNE premiered on TNT in summer 2009. Last summer, the series averaged 3.7 million viewers in its second season and ranked as one of cable�s top scripted series among women. TNT, one of cable�s top-rated networks, is television�s destination for drama. Seen in 100.5 million households, the network is home to such original series as The Closer, starring Emmy� winner Kyra Sedgwick; Rizzoli & Isles, starring Angie Harmon and Sasha Alexander; the Peabody Award-winning Men of a Certain Age, with Ray Romano, Scott Bakula and Andre Braugher; Leverage, starring Timothy Hutton; Hawthorne, with Jada Pinkett Smith; Memphis Beat, with Jason Lee; and Southland, from Emmy-winning producer John Wells (ER); as well as the upcoming Falling Skies, starring Noah Wyle, and Franklin & Bash, with Mark-Paul Gosselaar and Breckin Meyer. TNT also presents such powerful dramas as Bones, Supernatural, Las Vegas, Law & Order, CSI: NY, Cold Case and, starting in 2011, The Mentalist; broadcast premiere movies; compelling primetime specials, such as the Screen Actors Guild Awards�; and championship sports coverage, including NASCAR, the NBA and the NCAA Division I Men�s Basketball Championship. TNT is available in high-definition.